Today for PLC we were able to use this time to help plan instruction for our classrooms. As you know we have been studying the book "Making Thinking Visible" so we had a chance to plan some new thinking routines to use. I planned alongside Maggie Willett and we were able to complete CLO's (Content Language Objectives) for four math units. The entire staff reviewed the writing of these and then shared them through a staff website we have. We were able to look over each others and use them to help us write and adapt the ones we use each day in our classroom. 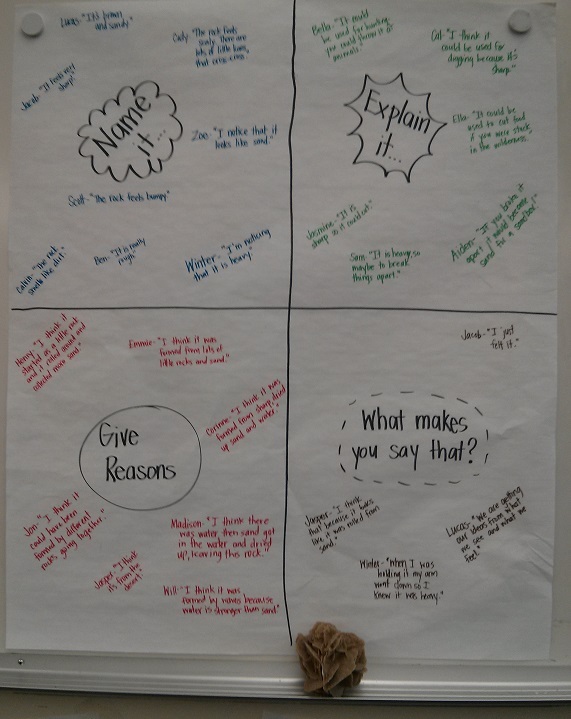 If you'd like to see the ones that I use, they are posted on the bulletin board right by the entrance of the class under the "What are we learning today?" section. Today we had a presentation by Michelle from PEBC. 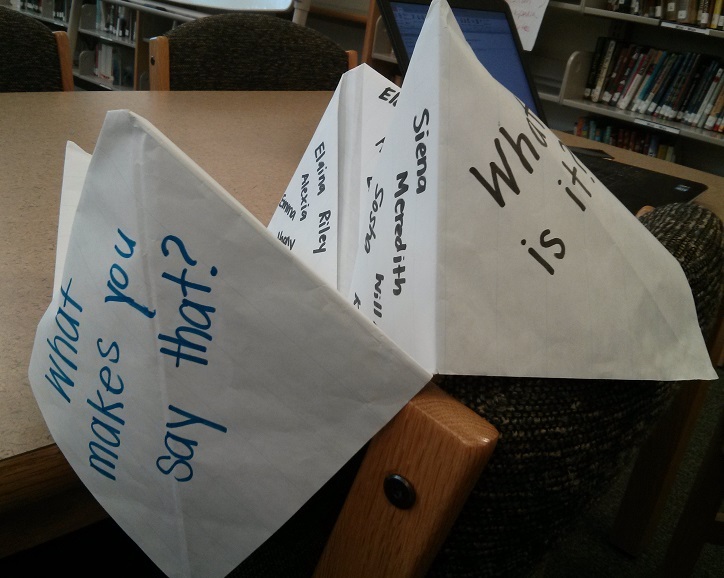 The staff brought artifacts from our thinking routine study that we have tried or used over the last month. I shared about a routine called "The Explanation Game". 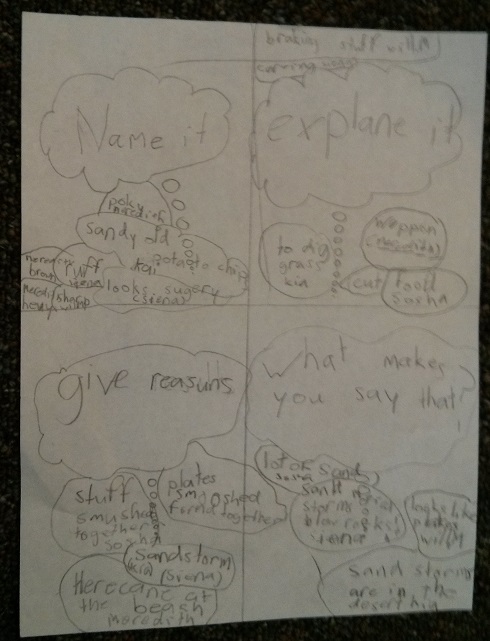 This thinking routine was to continue the work our class had done through our 'See, Think Wonder' routine. I wanted a way to really have them connect the scientific learning we had done (and are in the process of) to what they were seeing and apply it to the rocks we were studying in our classroom. For some reason, I must have skimmed over this routine while reading the book because when I went back to look at a new routine to mix things up, this one really spoke to me and I didn't remember it from my original read. The purpose of this routine was to have my class begin to explain and use scientific reasoning to explain what they observed in rocks. What I did: I introduced this routine to my class by being very honest and saying that I really wasn't sure how I wanted them to show me the outcomes of this routine-but it sounded very fun and seemed to be just what our class needed. I read the section in the book (the gray box) and said I thought we might adapt it a little. I guided their thinking to four ideas/questions that we needed to explain for our 'Explanation Game' round. Extend: My plan is to use this routine again, but have it a little more structured. Both classes did a great job of showing their thinking and I would like to combine their creativeness to come up with a routine that I can use in both classes. Challenge: The biggest challenge for this routine was that it took us two class sessions to complete. I think this may have been mostly due to the fact that it was our first time and I wasn't very clear on what I wanted as an outcome for the routine. I felt like this allowed for a lot of genuine conversations and the students were really trying to figure out how this rock was formed and create scenarios based on their scientific knowledge. I really enjoyed it and will be using it again!